Thrift Schooling: Whom Do I Fear More? Whom Do I Fear More? As parents, I know we all fall guilty, at one point or another of giving in to our kids whims. Let's face it, even from the time they are little it's so much easier to simply give them that cookie they are begging for than firmly saying, no, (in love of course). It's just, if we choose to give in when they are little, how long are we going to keep on giving in? When they are school age? Pre-teens? Teenagers? I know, there are days when I am simply exhausted and those are usually the times when I give in. The problem is, I KNOW what is the right thing to do, most of the time, it's just having the STRENGTH to do it! In terms of homeschooling, many days (especially Mondays) it is a battle of the will. The children have just come from two days of having off from school so they are thinking about the fun things they would rather be doing instead of their schoolwork! The daydreams of riding their bikes or whittling with their pocket knives interrupt their time for learning. Now of course I'm not going to give in and say, "okay, go ride your bike all day today and forget about school," but there are times that I don't deal with the attitude and the issues of their little hearts. It's at this point I need to ask myself. Whom do I fear more? 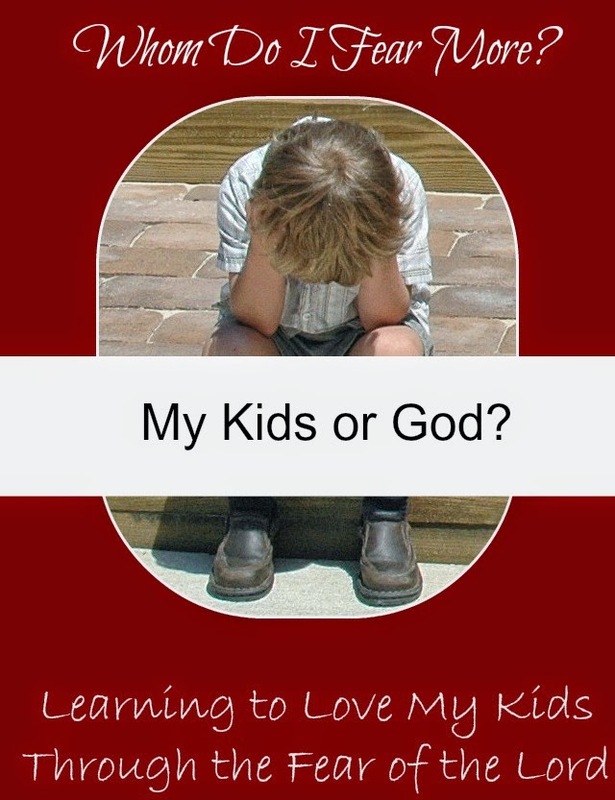 My kids or God? "The fear of the Lord is the beginning of wisdom" (Proverbs 9:10). When we choose to fear God over our kids tantrums and attitudes, it can help us to pull away from the emotional stress involved with discipline. Rather than taking our children's struggles personally, even if directed at us, we can find wisdom in each situation by fearing God. If we fear how our child is going to respond, are we going to give in to prevent the tantrum? Unfortunetly, that is not fearing the Lord. It brings confusion and strife rather than the fear of the Lord into the home. If we fear that our child is going to be a terrible speller do we continue to talk to others about how terrible their spelling is leading them into a deeper pit of low self-esteem? If we cast out fear and fully trust that the Lord can teach us how to raise our kids then we will slowly be able to gain wisdom. Wisdom doesn't come in a day but it does come through experience. When King Solomon was king (the wisest man who has ever lived) he was forced to make decisions on the spot. Two women brought a child to him both claiming that they were theirs. He had to come up with a way to test these women right then and there. It was God who gave him the wisdom. The same God who helped King Solomon can help you and I as parents, today. In each situation, if we fear Him, we can ask for help and he will grant us the wisdom we need. Try it, you might be surprised what comes out of your mouth. God will equip you with everything you need to train up your children, you just need to ask as situations come up!